India has the fourth largest iron ore reserves in the world after Russia, Brazil, and Australia. As per the survey conducted by the Indian Bureau of Mines (IBM) in April 2000, India had 9919 million tonnes of recoverable reserves of haematite and 3546 million tonnes of magnetite. As good quality iron ore deposits are depleting very fast, beneficiation technologies have to be adopted to meet iron ore demand. Agglomeration technologies such as pelletization/sintering have to be added to steel plant so that concentrates can be used as feed material. Pelletization plants beneficiate fines and transform the unusable low grade fines into an easily consumable feed for blast furnaces. The present production capacity of pelletization in eastern region is 28.7 MMT, which will increase to 40.7 MMT in the coming time after commissioning of about 9 number of units, which are at various stages of commissioning. With the growing numbers of pelletization plants, various impacts on environment and health will rise. A critical part of any Occupational Health and Safety program is the identification, assessment, elimination and/or the control of hazards in the workplace. Risk assessment is the process of evaluation of the risks arising from a hazard, taking into account the adequacy of any existing controls and deciding whether or not the risks is acceptable. It is impossible to eliminate all hazards, so the goal is to eliminate and/or control the hazards with critical and high potential risk to the lowest reasonable risk level so as to protect workers from harm. Result in the pollution of the general environment. Hazard means a source or a situation with a potential for harm in terms of human injury or ill health, damage to property, damage to the environment, or a combination of these. Hazard identification means the identification of undesired events that lead to the materialization of the hazard and the mechanism by which those undesired events could occur. Risk is, at minimum, a two-dimensional concept involving (1) the possibility of an adverse outcome, and (2) uncertainty over the occurrence, timing, or magnitude of that adverse outcome. If either attribute is absent, then there is no risk. Risk assessment is a systematic process for describing and quantifying the risks associated with hazardous substances, processes, actions, or events. Risk assessment method can be defined as any self-contained systematic procedure conducted as part of a risk assessment – that is, any procedure that can be used to help generate a probability distribution for health or environmental consequences. Hazard Identification Risk Assessment (HIRA) is a process of defining and describing hazards by characterizing their probability, frequency, and severity and evaluating adverse consequences, including potential losses and injuries. A risk assessment that provides the factual basis for activities proposed in the strategy to reduce losses from identified hazards. The ISO Risk Management Principles and Guidelines standardize risk assessment in four parts: risk identification, risk analysis, risk evaluation, and risk treatment. The first step — risk identification — is achieved by identifying all hazards and their subsequent consequences. Local risk assessments must provide sufficient information to enable the jurisdiction to identify and prioritize appropriate mitigation actions to reduce losses from identified hazards. 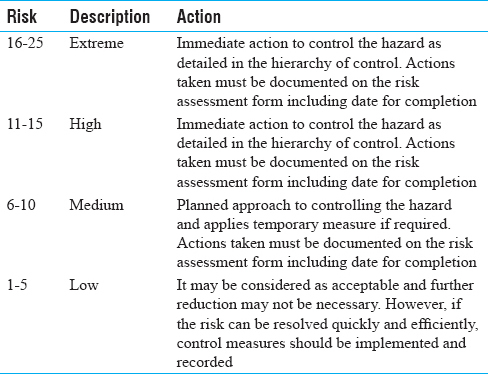 Hazard control means the process of implementing measures to reduce the risk associated with a hazard. Engineering and administrative controls applicable to the hazards and their interrelationships, such as appropriate application of detection methodologies to provide early warning of release. The study was cross-sectional in design and involved semi-quantitative methods of data collection. Primary data was obtained by inspecting the work place, interacting with employees regarding the possibility of hazards, reviewing the department procedure manual, work instructions, standard operating procedure, and incident report, whereas secondary data was collected using Material Safety Data Sheet (MSDS), first aid/injury register, health record of employees, journals, and literatures. The study was carried out in a 4-m tonne iron ore pelletizing industry located in Odisha, India from March to December 2015. The pellet plant used travelling grate technology to convert low grade fines into value-added pellets. The slurry was received at the pellet plant from the beneficiation plant through a 220-km pipe line. It was stored in the holding tanks before being fed through pressure filters and mixed with the additives. The purpose of the additives - limestone, bentonite, coke, and anthracite – was to improve the physical and metallurgical properties of the pellets during processing and in final use. A disc pelletizer was then used to ball the mixture into “green balls” about the size of a marble. A roller screening mechanism was used to remove any undersized material before the green balls enter the final stage of production, the induration furnace. The induration process used travelling grate technology and a series of updrafts and downdrafts to dry and gradually heat the green balls to remove moisture before entering the combustion zone where they were first preheated to minimize thermal shock, then fired, and ultimately cooled in various sections of the furnace. After screening out oversized and undersized pellets, the final product – which had the required properties for charging a blast furnace and ready to withstand handling and transportation – were transferred by conveyor to a stockpile. 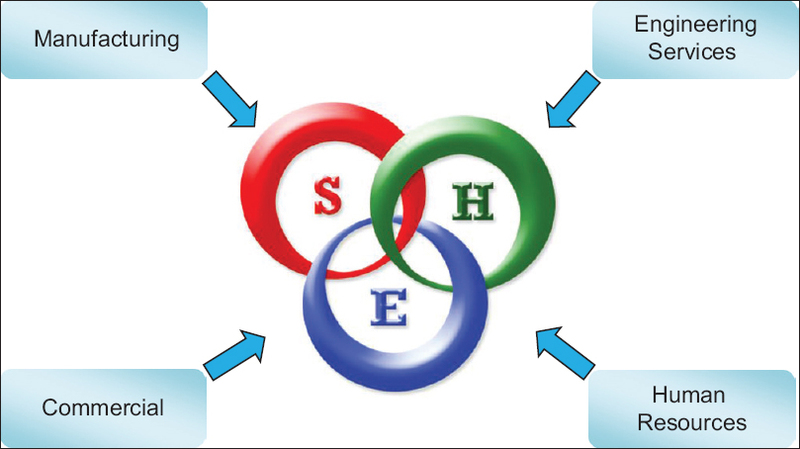 The different steps of methodology are mentioned in the [Figure 1]. Reviewing health records of employees. After all the possible hazards were identified, the occupational health risk that could be associated with the hazard was identified by studying previous incident reports, MSDS, first aid/injury records, and health records of the employees. The severity of the injury (or illness) resulting from the hazard. Risk rating can prioritize hazards with the highest potential to cause an injury so that they can be eliminated first [Table 3] and [Table 4]. Regular monitoring to check whether control measures are intact or not. 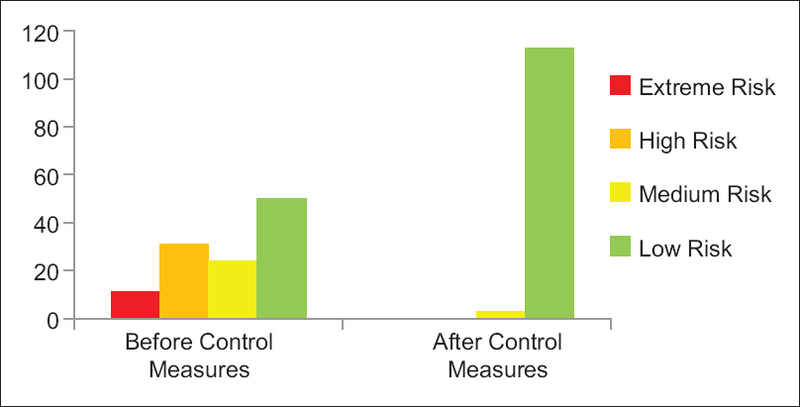 Evidence of monitoring and reviewing of the effectiveness of the controls. It involves reassessment of the risk to see whether there is a reduction of risk rating from critical and high risk to a level considered As Low as Reasonably Practicable (ALARP). In this plant, 116 hazards were identified and their analysis was performed. They have been classified into five major categories [Figure 2]. 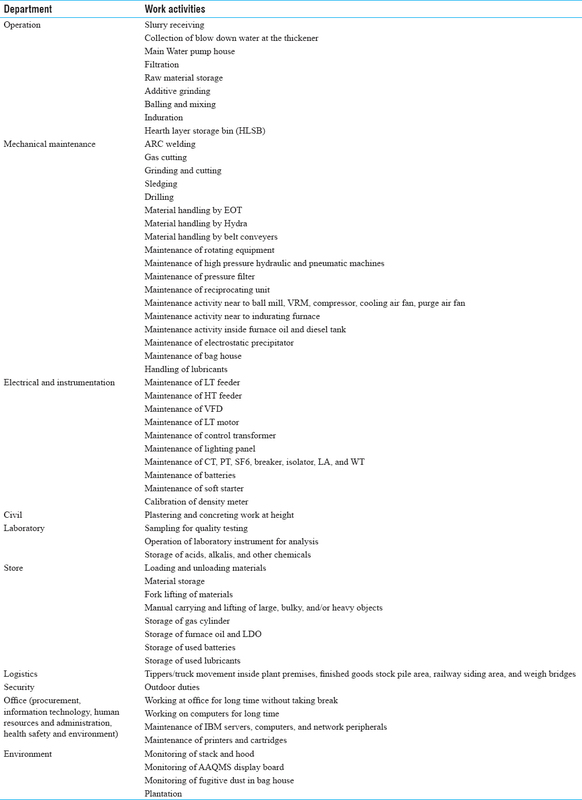 The major hazards, risk assessment, and the reduction of risk after taking appropriate control measures are tabulated below [Table 5] and [Figure 3]. Statistical analysis involves the calculation of the mean of a set of values in a sample used for observational study. Hypothesis testing is used to make an inference about a population that is under study. The null hypothesis is the assumption that the mean will be equal to zero. The paired t-test is a type of hypothesis testing that is used when two sets of data are being observed. The data in a paired t-test are dependent, because each value in the first sample is paired with a value in the second sample. The parameter used to make the inference is the difference of the means of both data sets. Statistical analysis was done using GraphPad's website. A value of P < 0.05 was considered significant [Table 6]. Results of the paired-samples t-test show that mean risk rating differs before taking control measures (M = 9.13, SD = 5.99) and after taking control measures (M = 2.80, SD = 1.38) at the 0.0001 level of significance (t = 12.6428, df = 115, n = 116, P < .0001, 95% CI for mean difference 5.34 to 7.32). On an average, risk reduction was about 6.33 points lower after taking control measures. In this cross-sectional study, it was found out that by applying control measures, hazards having high risk rating and above was reduced to a level considered ALARP. The findings suggest that Hazard Identification, Risk Assessment, and Control measures (HIRAC) study on a routine basis can serve as a tool to reduce occurrence of injury or disease in any manufacturing industries. Health, Safety, and Environment (HSE) department is the core pillar of any manufacturing industry. 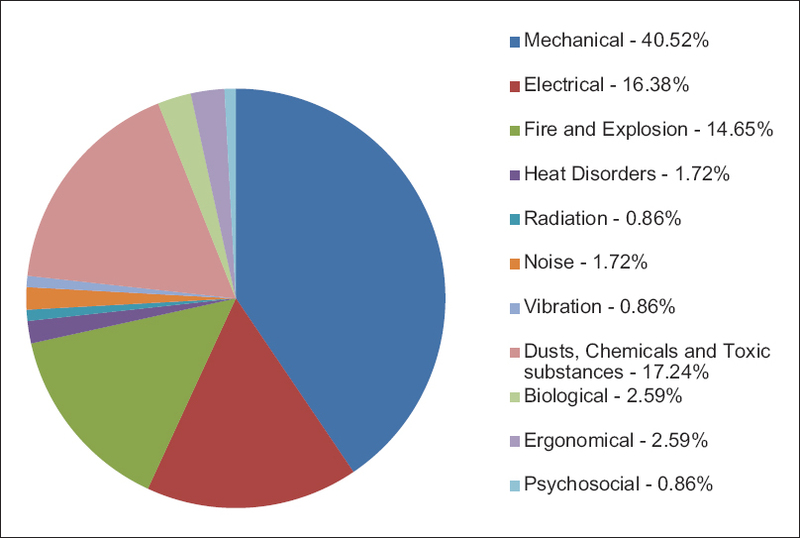 Other departments such as manufacturing, engineering services, commercial, and human resources are strongly linked with the HSE department [Figure 4]. HSE department has a lot of common functions and they play a great role in identifying hazards, risk assessment studies, and their control measures through monthly Safety Committee meeting. In tough economic times, it is important to remember that poor workplace safety and health costs money. What's more, case studies show that good Occupational Safety and Health management in a business is linked to improved performance and profitability. The concentrate slurry is received at pellet plant and stored in slurry tanks [Figure 5]. The concentrate slurry is fed to the filtration process where it is de-watered by pressure filters. The product comes out is called filter cake (moisture 9%), which is stored in bin for further process of mixing. The filtrate water so generated is sent to process reservoirs via thickener for storage and internal plant consumption. Pellet plant is facilitated with additives grinding unit as the process of pelletization requires binder and additives. Bentonite is used as a binder for proper balling of the filter cake particles in to spherical shaped balls with certain compression strength. The bentonite is stored and ground in a Vertical mill by dry grinding process to desired fineness (−200 mesh, 80%). The powdered bentonite is stored for further mixing process. Limestone is used as a fluxing agent and to get strength to the pellet by heat hardening. Coke dust is used as a compensatory fuel and to improve physical strength of the pellets by uniform firing of each pellet up to the core. Both limestone and coke are ground in a definite lime to coke ratio in a ball mill by dry grinding process. The product is lime + coke powder mix of desired fineness (−200 mesh, 80%) is stored for subsequent mixing process. In mixing and baling building, bentonite, lime + coke mix are added to the concentrate filter cake at a definite rate of addition and is thoroughly mixed in a vertical mixer. The so-mixed concentrate is called mixed material, which is fed to a rotating inclined disc pelletizer. Fine ore particles are agglomerated in to spherical-shaped balls due to the rotating action of the disc. The so-formed balls are called green balls which are further screened and fed to an induration machine. In induration building, the green balls are fed to the induration machine which forms endless chain of pallets, are slowly brought through different zones of the induration furnace by the horizontal movement of the pallets. These green balls are subjected to drying (280–340°C), preheating (350–900°C), firing (900–1330°C), and cooling (1330–100°C) in the induration furnace where pellets are in directly heated in a controlled manner by circulation of hot gases with the help of process fans. Heat energy is supplied by oil fired burners. LSHS/FO is used as fuel and source of heat energy, which is stored and pumped to burners. Critical parts of the induration furnace are cooled by water circulation. The fired and cooled pellets with good physical strength is conveyed and stored in pellet stock pile. The pellets are dispatched to the customers as a feed to blast furnace and/or Direct Reduced Iron production. A Material Safety Data Sheet (MSDS) provides basic information on a material or chemical product. It contains information on the properties and potential hazards of the material, how to use it safely, and what to do if there is an emergency. The MSDS is an essential starting point for the development of a complete health and safety program for the material. Material Safety Data Sheet (MSDS) Furnace Oil. Iron Oxide, Silica, Crystalline Silica as Quartz, Crystalline Silica as Cristobalite, Al2O3, CaO, MgO. Fumes (sulphur dioxide, oxides of nitrogen). However, semi-quantitative risk assessments are currently widely used to overcome some of the shortcomings associated with qualitative approaches. Semi-quantitative risk assessment takes the qualitative approach a step further by attributing values or multipliers to the likelihood and consequence groupings. It may also involve multiplication of frequency levels. All risks cannot be eliminated. Urgent action is required for risks assessed as critical or high which may include instructions for immediate cessation of the work and/or isolation of the hazard until permanent measures can be implemented. Documented control plans with responsibilities and completion dates need to be developed for moderate risks. Risk that is acceptable to regulatory agency and to the public is called acceptable risk. There are no formally recognized regulatory criteria for risk to personnel in the mining industry. Individual organizations have developed criteria for employee risk and the concepts originally arising from chemical process industries and oil and gas industries. Because of the uncertainties linked with probabilistic risk analysis used for quantification of the risk levels the general guiding principle is that the risk be reduced to a level considered ALARP. Replace – high-risk equipment or substances should be replaced by low risk ones. Work instructions for every activity. Use of physical barriers such as acoustic, thermal, electrical, etc. Use of Personal Protective Equipment (PPE) as shown in [Figure 6] to protect the worker from the residual risk. Workers must be trained regarding the selection and use of PPE. When prevention and protective measures fail, a work accident or an occupational disease could happen. The company needs to be prepared (emergency preparedness) and to have mitigation measures implemented. The aim of mitigation measures is to reduce the severity of any damage to facilities and harm to employees and public. To ensure the efficiency of control measures in use. The list of air pollution control measures are shown in [Table 7]. Gas flow through stack is done by two fans 42 and 32 connected to ESP. The ESP 42 and ESP 32 are designed to blow 400,000 m 3/h and 1400,000 m 3/h of air, respectively. The main raw material for the pellet plant is iron ore, which comes as slurry from the beneficiation plant through the pipe line. Hence, there are no fugitive emissions in raw materials handling area. Water sprinkling is done by the water tanker on the roads and work zone areas to minimize the fugitive emissions. Fixed water sprinklers are installed in product yard area and product conveyer area. In product area (HLSB), wet scrubbers are used to minimize particulate matter emissions and water sprinkling is done to decrease fugitive emissions. Despite all the control measures, continuous monitoring of suspended particles is essential to ensure that it is below the permissible exposure limit. The waste water from iron ore slurry is separated through filtration system and treated in the thickener. In the thickener, all de-dusting/scrubber return water is passed and the underflow is reused in the process. 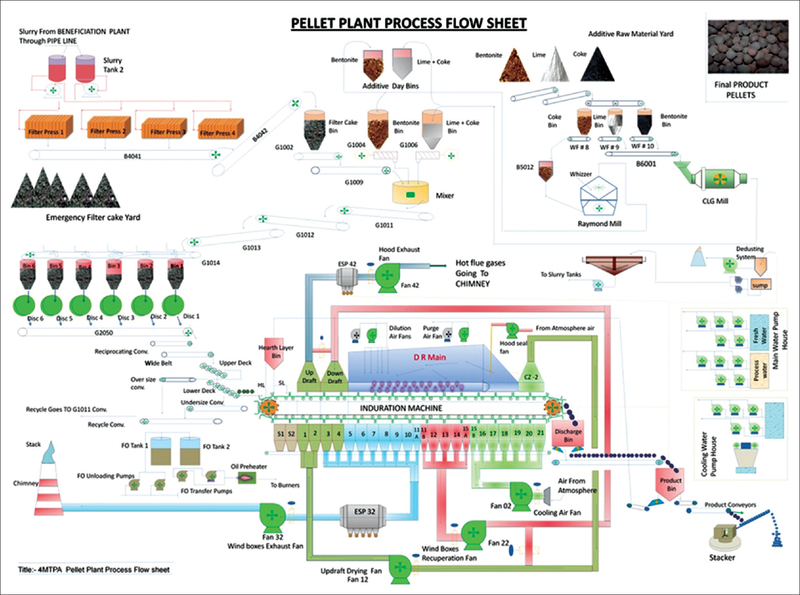 The pellet plant has a goal to achieve zero discharge norms with a comprehensive water and waste water management. The iron ore dust collected by ESP is recycled into the thickener for its reuse in the process. Any fugitive dust generated is extracted, collected through bag filters, scrubbers, and reused in the process. Thus, no solid waste is generated. Continuous monitoring of high noise area is done by sound meter to ensure that it is within the permissible exposure limit. Low noise generating equipments are used in the pellet plant. The equipment producing high noise are surrounded by baffles and covered with noise-absorbing material. Workers are provided with personal protective equipment to protect from noise (like ear muffs, ear plugs). Trees are important sinks for air pollutants and absorb the noise. They enhance the green cover, improve the ecology and aesthetics and affect the local micrometeorology. Trees also have major long-term impacts on soil quality and the ground water table. A total of 19,525 trees were planted in the plant premises on an area of 12.193 Ha. Proper housekeeping is an essential part of sound environmental management, which keeps the industry free from dusts. Health examinations are designed to ensure that the worker is fit for employment and that he remains in that state of fitness throughout his period of employment. Any deviation from good health must be detected early and managed appropriately. Health examinations of workers frequently reveal the existence of health hazards in workplace, thus necessitating environmental evaluation and control. This examination is carried out before employment of a worker in the workplace with potential health hazards. This helps in obtaining the baseline data. It also enables the management to place workers in jobs suited to their capacities and limitations. It includes physical examination of the various organs of the body, blood and urine analysis, radiographic examination, eye examination, audiometry, and spirometry. This examination is carried out at regular intervals after the initial examination. Emphasis is given on exposure. Periodicity depends on the nature and extent of the risk involved. Whichever method of eliminating and/or controlling the hazard is used, it is essential that an evaluation of its impact on the use of the equipment, substance, system, or environment is carried out to ensure that the control does not contribute to the existing hazard or introduce a new hazard. It is also essential that all people involved are informed about the changes and, when necessary, provided with the appropriate information, instruction, training, and supervision to ensure that each worker is safe from injury and risk to health. It is also recommended that after a period of time, the area supervisor carry out a review of the system or control to determine its ongoing suitability. The first step for protection of workers against occupational diseases and maintaining a safe workplace is defining and analyzing hazards. There is a need for HIRAC study as a routine practice in all manufacturing industries. This helps in achieving two objectives; first is identifying the critical and high-risk hazards, which need to be addressed on priority basis, and second, by applying control measures at the earliest, it reduces the risk to a level considered ALARP. I would like to express my deepest appreciation to the Managing Director of the Pellet Plant for encouraging me to conduct this study. I would like to thank the employees and the workers of the Pellet Plant for participating in the study. Finally, I take this opportunity to express my deep sense of gratitude and indebtedness to my beloved teacher and guide Dr. Barun Kumar Sikdar, Deputy Chief Inspector of Factories (Med) and Certifying Surgeon, West Bengal for his encouragement and support. Singh GP, Choudhary RP, Vardhan H, Aruna M, Akolkar AB. Iron Ore Pelletization Technology and its Environmental Impact Assessment in Eastern Region of India - A Case Study. Procedia Earth Planetary Sci 2015;11:582-97. BSI - British Standard Institutions, Occupational health and safety management systems – Requirements, BS OHSAS 1800, 2007. Available from: https://www.ilo.org/dyn/natlex/docs/WEBTEXT/32063 /64873/E87IND01.htm. [Last accessed on 2017 Oct 12]. Director General Department of Occupational Safety and Health, Malaysia. (2008). 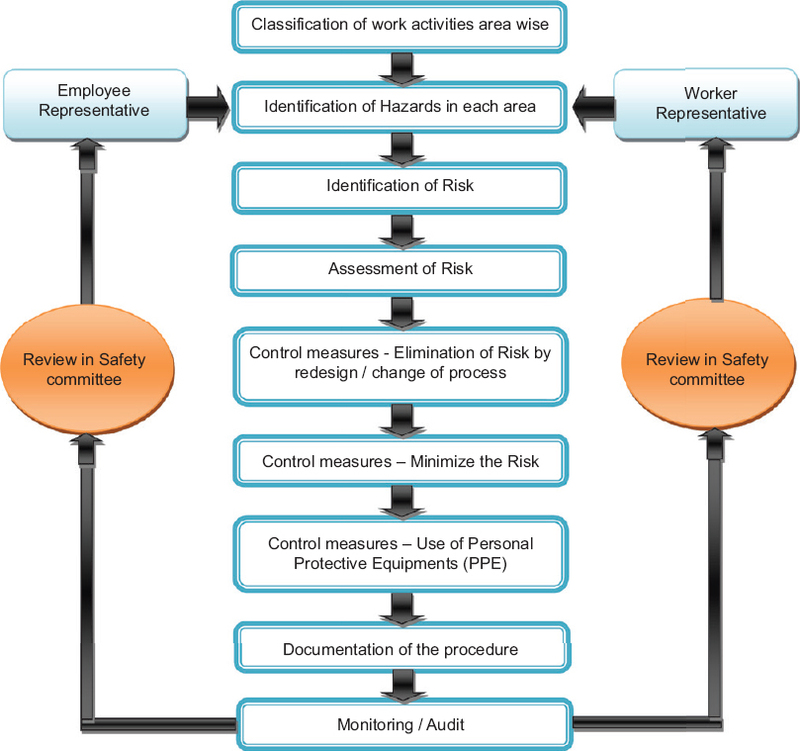 Guidelines for Hazard Identification, Risk Assessment and Risk Control (HIRARC): 1-34 Available from: http://www.dosh.gov.my/index.php?option=com_docman&task=cat_view&gid=15&Itemid=179&lang=en. [Last accessed on 2017 Oct 11]. V.T. Covello, M.W. Merkhoher. (1993). Risk Assessment Methods: Approaches for Assessing Health and Environmental Risks: 2. M. SaravanaKumar, Dr.P. SenthilKumar. Hazard Identification and Risk Assessment in Foundry. IOSR Journal of Mechanical and Civil Engineering (IOSR-JMCE):33-7. Yaneira E. Saud, Kumar (Chris) Israni, and Jeremy Goddard. (2014). Bow-Tie Diagrams in Downstream Hazard Identification and Risk Assessment. Process Safety Progress 33:26-35. Available from: http://www.newcastle.edu.au/current-staff/working-here/work-health-and --safety/managing-health-and-safety-risks. [Last accessed on 2017 Oct 04]. Stephanie D. Wilkerson, Dr. Sindhu Unnithan, Dr. V.J. DuRapau. (2008). Application of the Paired t-test. Xavier University of Louisiana's Undergraduate Research Journal. Scholarly Note 5(1):1-5. Available from: http://graphpad.com/quickcalcs/ttest1.cfm. [Last accessed on 2017 Oct 11]. Available from: https://osha.europa.eu/en/themes/good-osh-is-good-for-business. [Last accessed on 2017 Oct 12]. Jessie M Callaghan, Catherine J Dumschat, Yvonne M Pietersma, Robert F Whiting. (1996). The MSDS A Basic Guide For Users - International Version. Available from: http://ccinfoweb.ccohs.ca/help/msds/msdsINTGUIDE.html. [Last accessed on 2017 Oct 12]. Material Safety Data Sheet (MSDS) Iron ore; Cliffs Natural Resources. Material Safety Data Sheet (MSDS) Bentonite; Sciencelab.com, Inc.
Material Safety Data Sheet (MSDS) Lime. Frodesiak A. (2012). 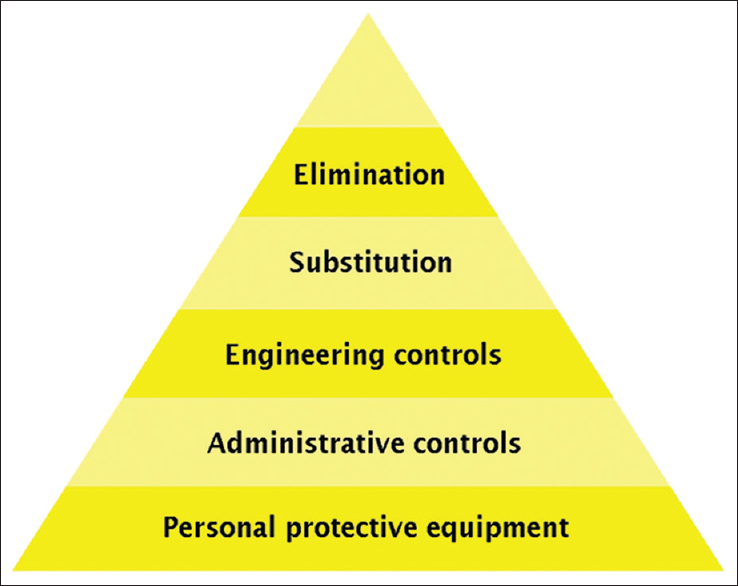 Hierarchy of hazard control diagram. Available from: https://en.wikipedia.org/wiki/Hierarchy_of_hazard_control#/media/File: Hierarchy_of_hazard_control_diagram_01.jpg. [Last accessed on 2017 Oct 10]. Available from: https://oshwiki.eu/wiki/Occupational_safety_and_health_risk_assessment_methodologies. [Last accessed on 2016 Oct 27]. Available from: http://www.ors.od.nih.gov/sr/dohs/HealthAndSafety/Pages/illnesstrends.aspx. [Last accessed on 2017 Oct 11].